Stereocards were a popular way of sharing images in the era when personal photography was a difficult proposition. This week I'll show some of the great cards in our collection from the turn of the century. 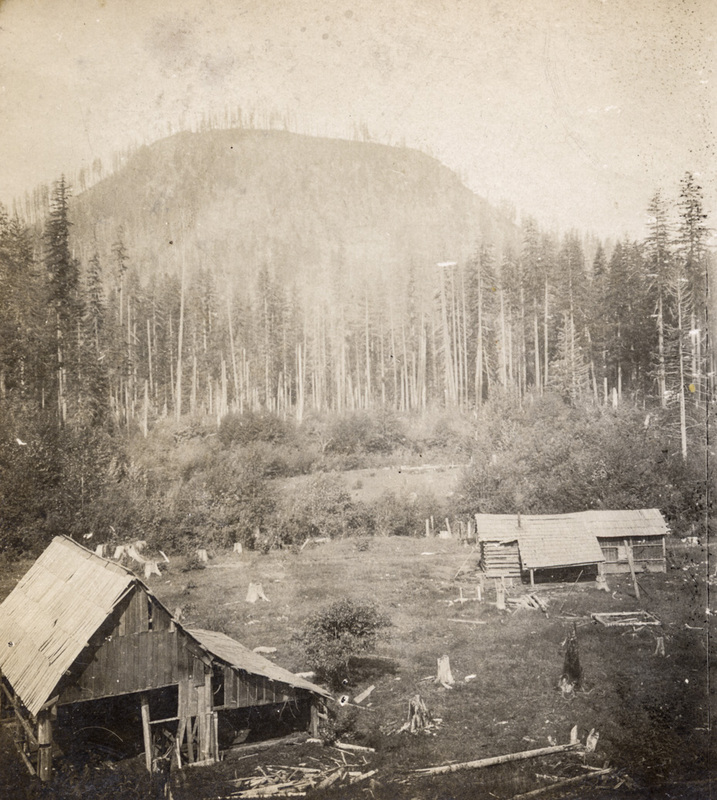 This unattributed card is just labeled "Homestead, Hood River". I don't recognize the knob. Can anyone identify the location? I am guessing probably somewhere up around Dee, with the Hood River going down on the other side of that house or what had once been a house. Another guess and only that is up somewhere above Parkdale on that portion of the east fork. Lots of tall timber over there. It will be interesting to see who identifies this hill. The Stereocard is old. The homestead is even older. Maybe one of the first in the area? Seconding L.E. 's thought: This photo was taken somewhere near 1900, I would think? And while I'm sure the house and barn were never properly "square", they would need another 20-30 years at least to get this bad looking. These structures would've been built 1860-1880? It appears that the timber stand is pretty dense which would point to the western part of Dee Flat. Just a guess, but that area receives the most rainfall. I have never been to the north end up the Parkdale Lava flow and looked southward at any one of the lopes of the flow, but maybe this is one of them. Could reasonable have been taken from near Lava Springs I would think. I don't think that mound is in the HR Valley. I agree with Dan. This may say "Hood River Homestead" but it is not located in the valley. I'm not giving up yet. While it looks like a discrete knob it could be just an unusual angle on a larger feature. I found a very good match in Google Earth looking W from the northern corner of Dee Flats off Oleary Road. If this is located in the Hood River Valley, could it be located in an area of one of the earliest mills. Anything in the Neal Creek area? The Neals established their sawmill in 1861. I'm guessing this is one of the Butte's between Husum and Trout Lake. Could be wrong but it looks really familiar. I was just looking at this photo of the Dee Mill that we saw last month. Any resemblance to the hill in the background? The photographer has to be standing on a steep hillside. No drones in those days. The shadow indicate the photographer is looking in a northerly direction, somewhere between NW and NE.